Art is subjective, so what someone hangs in their home or office is a matter of taste, style, and opinion. With that said, there are certain practices to avoid when hanging art. Whether for aesthetic purposes or avoiding unnecessary damage to artwork, here are some common tips to consider when hanging art. Avoid hanging art in direct sunlight to prevent damage to the artwork. Artwork should be properly lit, but avoid using Earth’s most abundant light source—sunlight. Direct sunlight can lead to irreparable damage. 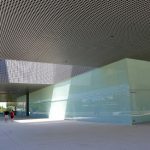 The ultraviolet radiation from the sun can cause artwork to fade, crack, or warp. Art on paper is much more susceptible to UV damage than canvases or metal, but all mediums should avoid direct sunlight. Instead of the sun, consider other lighting options such as LED. All light fixtures emit UV, but some are better for art than others. The artwork’s center should be 57 inches from the ground to match average eye level. There are a lot of considerations to take into account when hanging art, but one of the top factors should be artwork height. It is easy to hang art too high and make it seem like it’s awkwardly floating in a room. 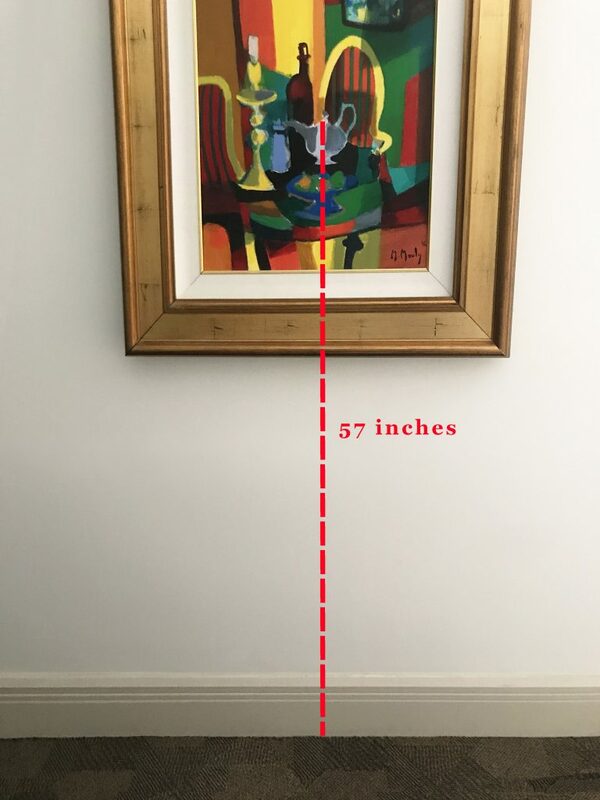 The easiest way to resolve this is to hang the center of the art about 57 inches from the floor, which is the average eye level. Not hanging art too high goes for art above furniture as well. 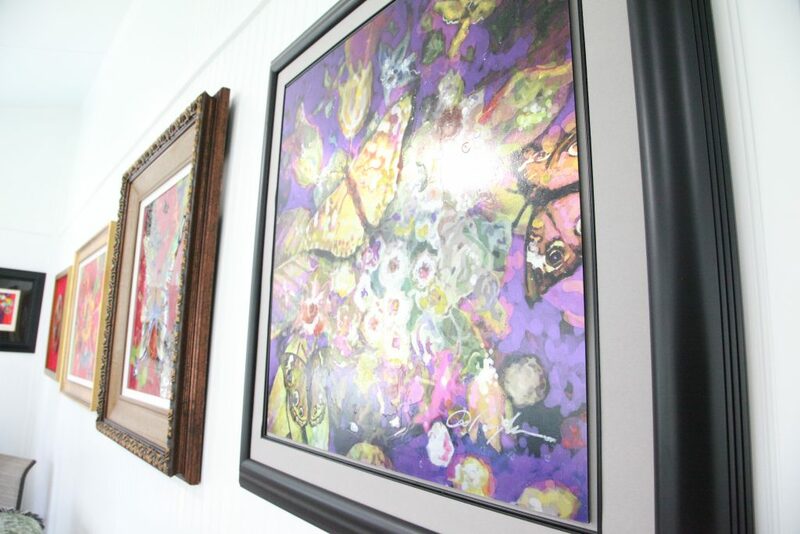 The bottom edge of framed and unframed artwork should be fairly close to furniture. The recommended distance is about 8 inches. To avoid damaging a work of art, do not place it in an area where temperatures fluctuate more than 20 degrees Fahrenheit on a daily basis. For example, don’t place artwork in an attic in the summer or an unfinished basement in the winter. Relative humidity is also an environmental factor. Relative humidity is a percentage that indicates the amount of moisture in the air relative to how much the air can hold. For example, 50 percent relative humidity is air that contains half the vapor it can hold at that temperature. For artwork, the relative humidity of a room should be around 20 percent. Humidity can be measured using devices known as hygrometers. Your artwork may not be as large-scale as this work by Dominic Pangborn, but larger works should be hung on at least two points by its wires. One of the last things a collector wants to see is their beautiful artwork crash to the floor after they’ve finally hung it on a wall. When possible, use a stud as an anchor point for hanging art so the nail or hanger can support the art. Larger works of art should be hung using two points instead of one for more stability. This is a subjective consideration, but in general it is best to hang artwork that will fill the space properly. Hanging a small work of art in a large, empty space can make the room and art look disjointed. Filling wall space with the properly sized art makes for a pleasing aesthetic. Try using large-scale artworks to fill the space. This doesn’t mean you must always collect or hang large art. 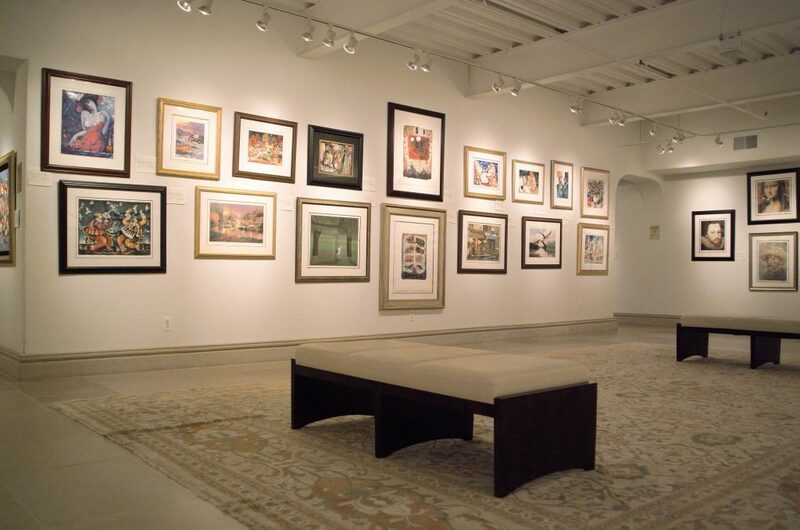 In fact, multiple works of smaller art displayed in a large space can create a striking arrangement. Want more tips and information about displaying art? Follow Park West Gallery on Facebook, Twitter, Instagram, and Pinterest for more articles about hanging art. Thanks! Useful tips re hanging art! It caught my attention when you said that direct sunlight can cause irreparable damages because ultraviolet radiation from the sun can cause an artwork to fade and crack. With that in mind, we’ll be sure of choosing an area where we can place the art pieces that we’re planning to buy. 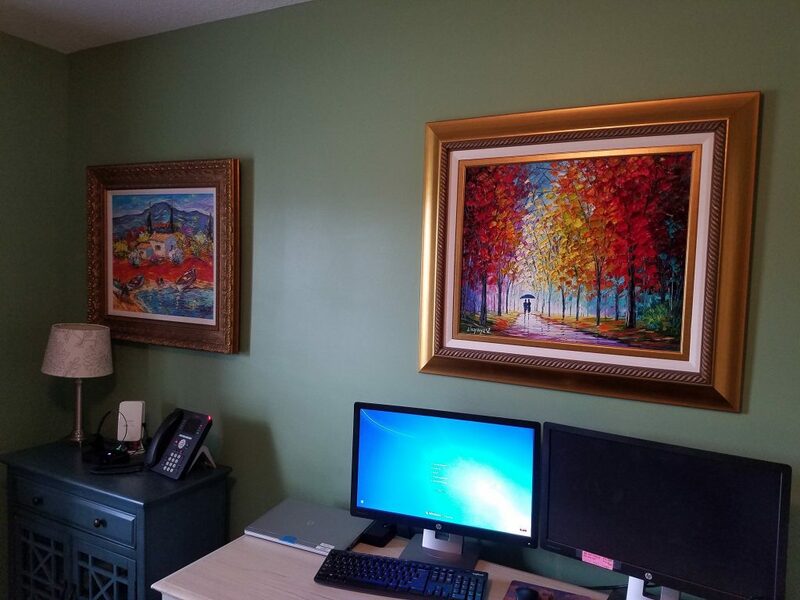 My husband and I want to make sure that the art pieces that we will buy can look good for many years because we want to save money on replacements.